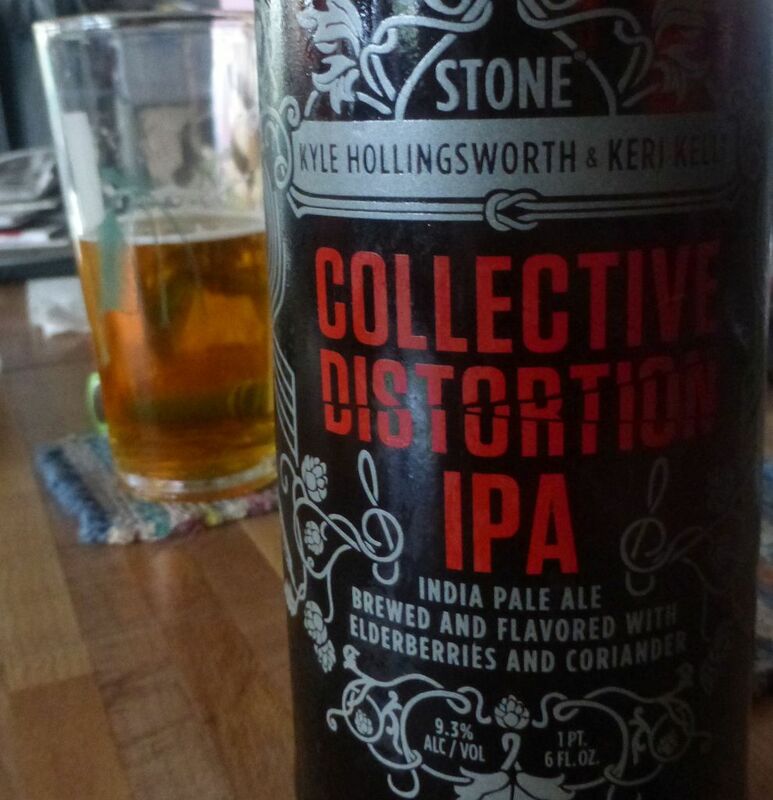 Stone has been making IPAs for so long that inevitably they would feel an urge to push the envelope when it comes to flavor. Earlier this year they put out an intense grapefruit IPA and this latest experiment brings in two rockers to add in the fun. Collective Distortion is brewed with a base of an undisclosed hop variety and adds on top of that the flavors of elderberry and coriander. I was a bit curious what exactly an elderberry is so I did a little reading online. According to Wikipedia it is similar to the huckleberry and the blueberry. Some areas commonly use elderberry to make wines and cordials as well as sweet syrups from the blossoms. Most of these flavors are more commonly enjoyed around Europe so it adds an interesting twist to a San Diego beer. Poured into a glass, Collective Distortion is an amber color right in the middle of the color scale for IPAs. The beer in the glass pictured is not collective distortion. When I first had some at a friend’s house I could barely taste the berries under the flavor of the hops. In contrast, the bottle I had at home was much more tart from the berries with some nice mellow coriander flavors complimenting the flavors nicely. It is certainly a bitter brew although it didn’t have the overwhelming bright citrus flavor you might expect from a Stone IPA. I was quite satisfied with what I tasted in this brew although I am not sure that I would rush out to buy a case. I still tend towards the citrus focus on my IPAs. This is certainly a beer that every IPA fan should grab and try at least once.